Well….the room is as complete as it is going to get. I’m making myself stop. I’m sure you all know that feeling. I could continue adding, taking away, changing all day long on this room. I wanted to capture what it looks like now, as we may be moving in the near future and it will change all over again. So please enjoy my kiddos room for two! OK…its perfect!!!! I love how there are two distinct feelings, boy/girl. very good job Bri you are so talented. I am in love with the Storage area in front on the window. I have been looking for something similar to put in my room. Its very small and I have to make good use of the space. Where did you find those and the wall storage, if you don't mind me asking. By the way new follower from the blog hop. Hi Danielle…I don't mind you asking at all and welcome =) Under the window is actually two separate 2-cube bookcases from Target. 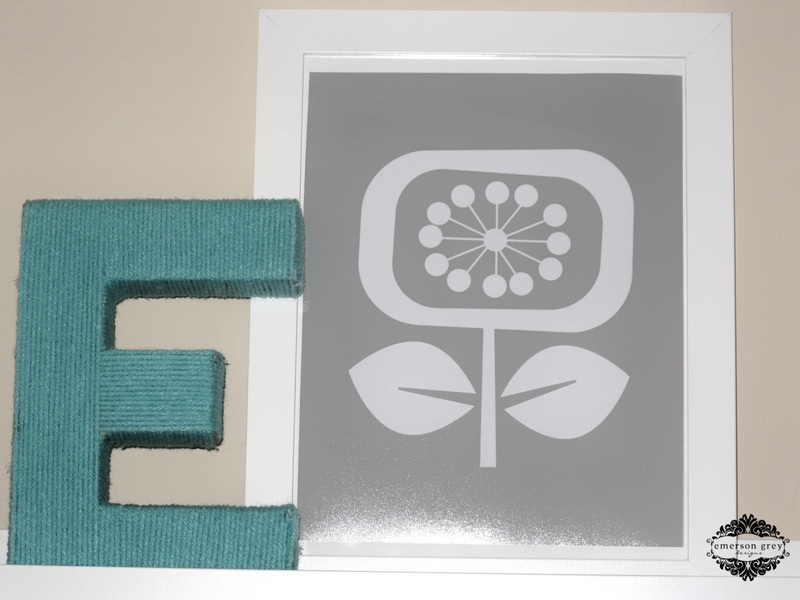 They are similar to this one http://www.target.com/p/Large-Divided-Cube-White/-/A-10535804 but I found mine instore and they were only $15 each. You want to make sure the center divider is stationary, instead of an adjustable shelf, so that when you put it on its side, it stays in place. I then added a leg kit from Ikea to each individual cube bookcase. So they can actually be pulled apart and still stand. I did have to purchase smaller screws then the ones included with the leg kit. Love your style! I found you via the live.laugh.rowe blog hop party. Looking forward to getting to know you. Thank you Eva! I couldn't agree more…loving all the new blog "friendships"
Bri. 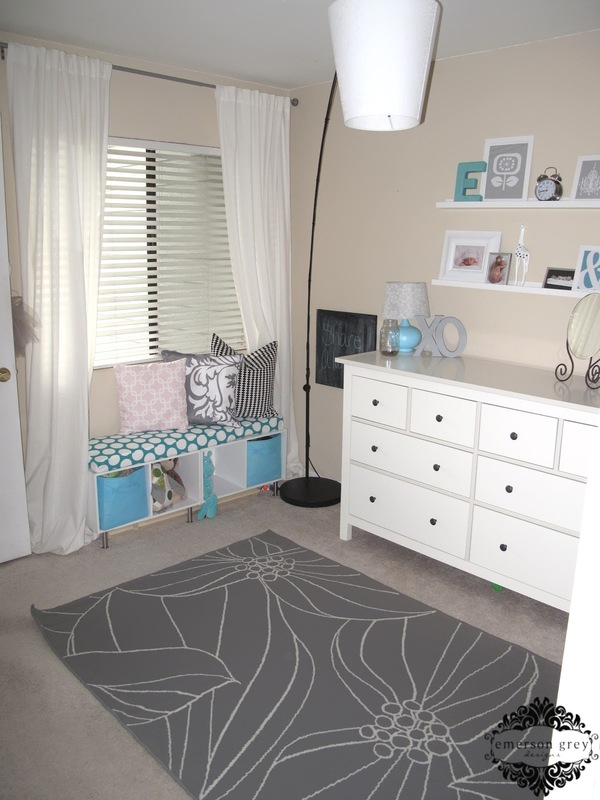 your kids' room turned out so wonderfully. 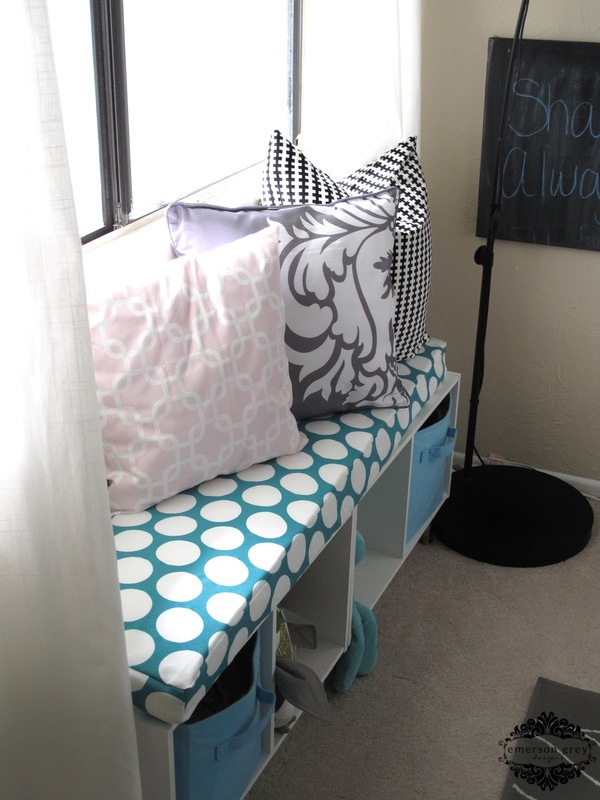 You have created such a fun space for your two little ones. 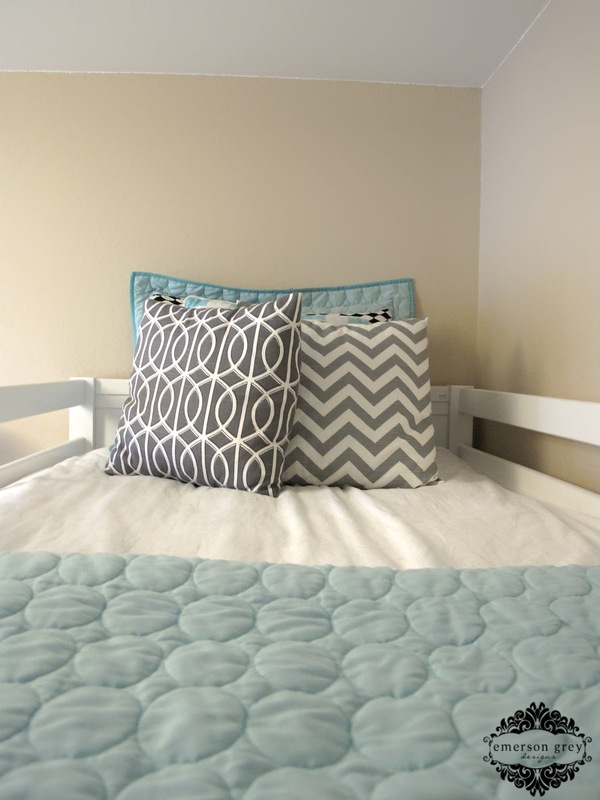 I love that you were able to create a space that works well for both genders! I hope your kiddies get to enjoy the space for awhile before you move, but I know that you will create a fabulous room for them in your new home as well! Bri – This turned out amazing! Makes me want to start all over with both boys rooms!! You are so so talented. What a soothing place for your little ones to share and enjoy. Keep up the good ( i mean, AMAZING) work!!! So impressive. 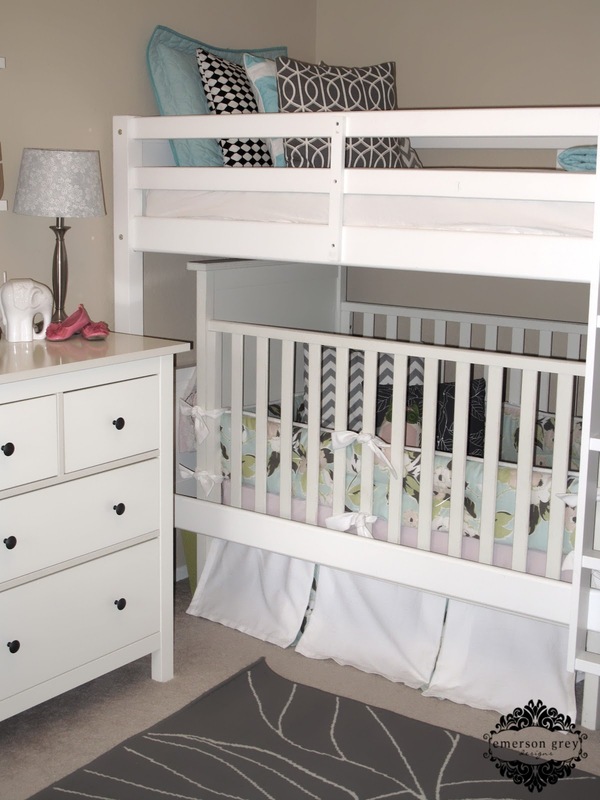 Love the idea of putting the crib under the bunk bed to free up room… do you have issues getting your little one in and out? Bless my daughters heart, but she learned what "duck" meant other then the quack, quack way. =p Its been fine so far, and we are completely enjoying the extra floor space. I do have a higher crib then the newer ones out on the market now, so if I had a lower set crib there would be plenty of space to pull her out. Newest follower over from the blog hop! 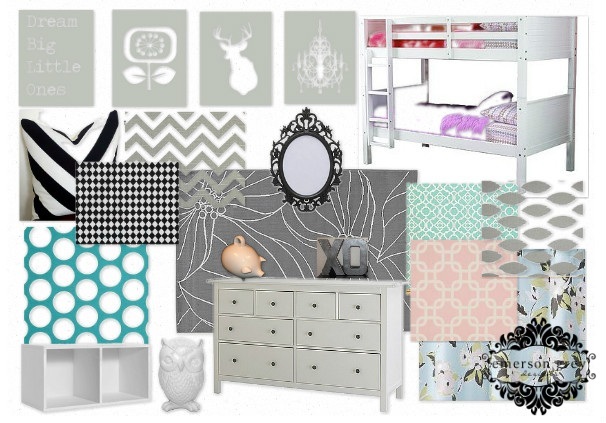 Oh my, if my babies were small today I would have a blast decorating their rooms. 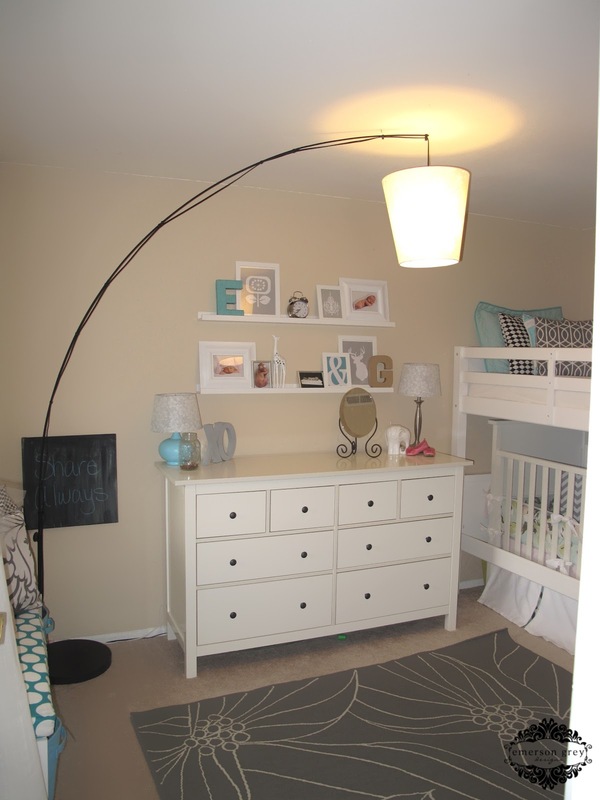 Your kids room is just beautiful, you did an amazing job…can you do my girl's? I'm so glad I found your blog and look forward to following along! Hi Andrea…welcome! 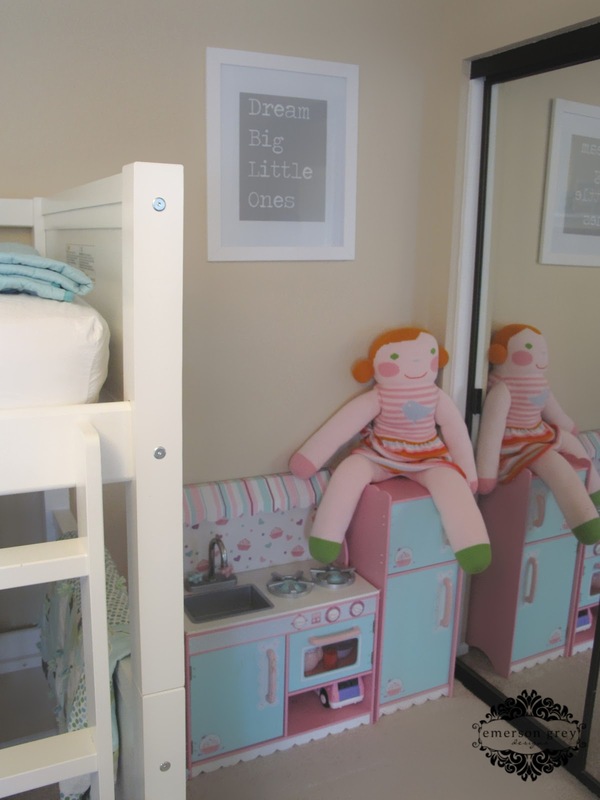 Thank you for the compliment…it was a lot of fun coming up with something that worked for both my kids personalities… ya know I'd love to do your girls room =) I don't just do nurseries. Have fun following along. 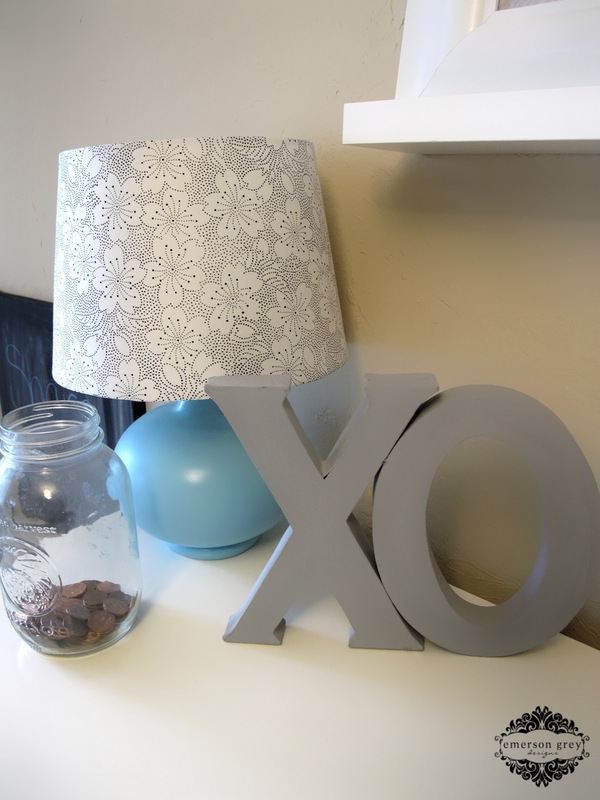 The room looks great and your blog is so cute! 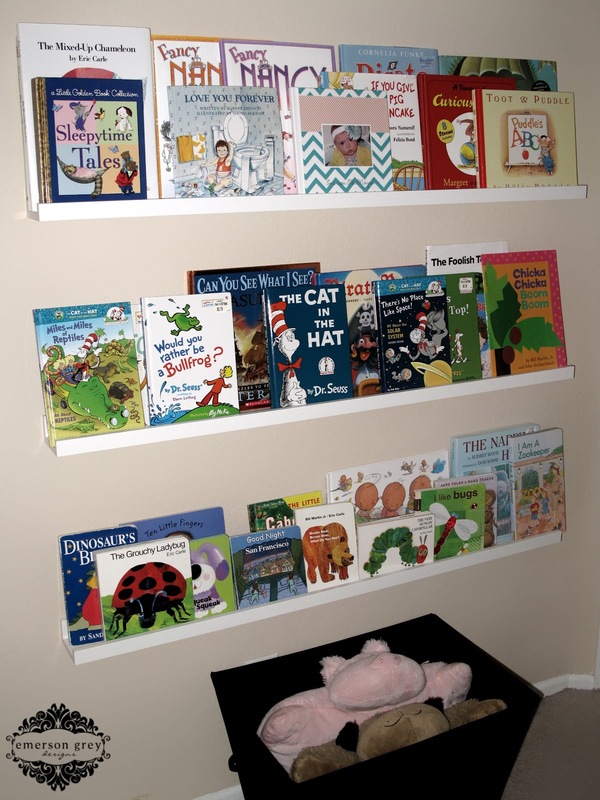 If I can ask, where did you find your book shelves? We are looking into doing the very same thing with the crib bunk combo. Did you use a regular crib and bunk and just remove the mattress from the bottom? I can't find an actual manufactured crib bunk any where! Beautiful room! We used just a regular bunk bed we found through Walmart.com and assembled it per the instructions. We just didn't install the wood planks that would have held up the bottom twin mattress. And our crib was a full size crib with actually very high sides. 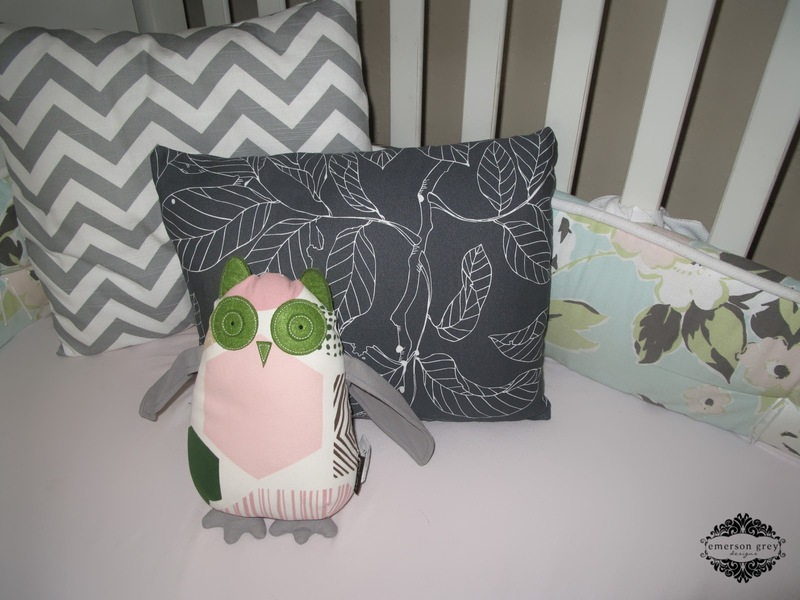 I suggest grabbing something similar to the Baby Mod crib or the Ikea crib. Those are lower set and will give you even more clearance then we had. Hi–great room! 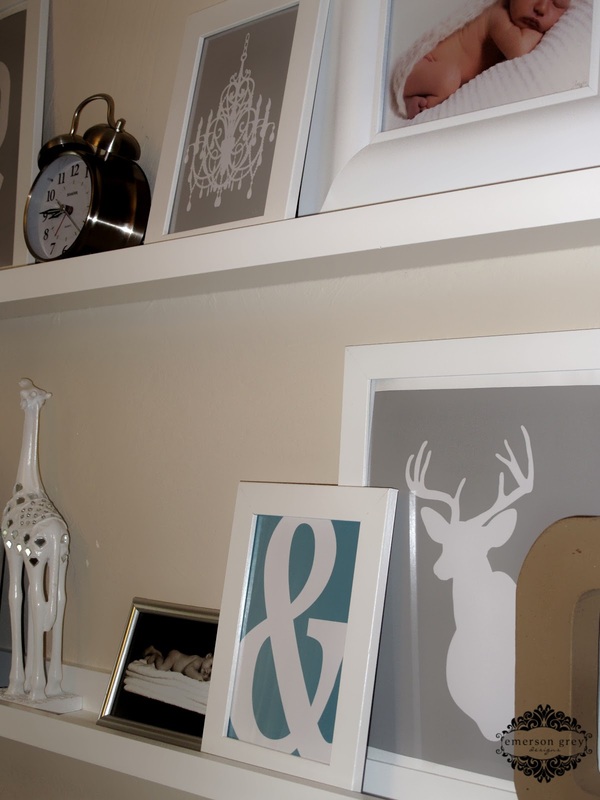 Wondering where you found the gray prints used on the bookshelves? Hey I was wondering where did you get the black lamp and the elephant on the dresser? 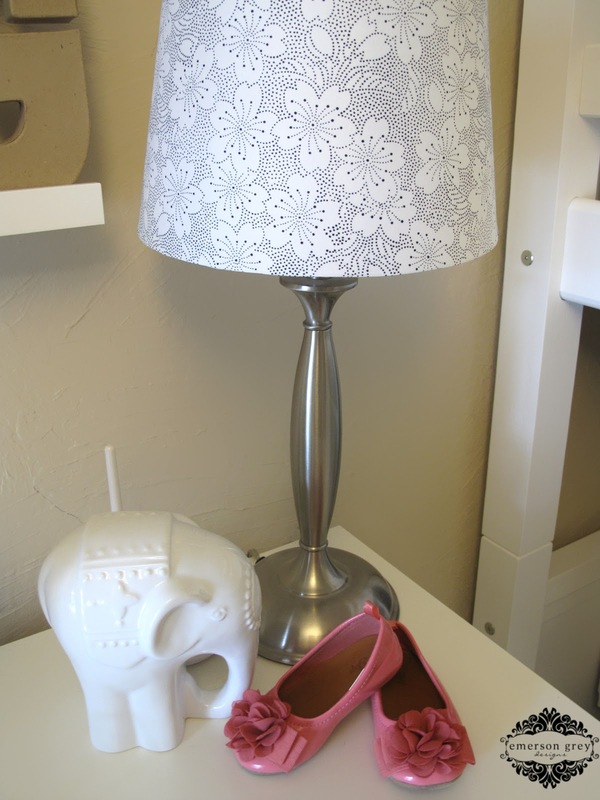 Hi Jennifer…The lamp was from Target and the Elephant was a cute find at Michael's years ago. Hi. I live in a tiny studio with my 11 month old. I love your crib and bunk design. Do you have any ideas on how i can incorporate that for me and my daughter? I'm pretty sure we have the same bunked, and we are looking at doing this, do you feel any support is lost making the bed wobbly or less stable? Where is that dresser from? 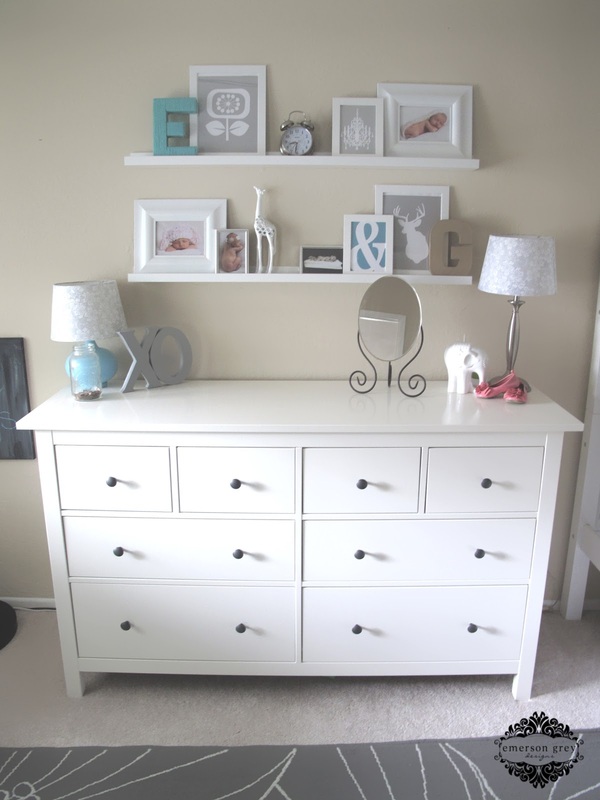 Hi Jennifer…it's the Hemnes dresser from Ikea. How hard is it to get the baby into and out of the crib? I want to do something similar for my girls but "big girl" doesn't like how tall the loft beds are.